When we find articles of interest, we’ll post them here so you can read, enjoy and maybe even learn. With Audio Consumption Up, Radio Helps Reach More Americans. A number of recent studies from Nielsen and Westwood One showed the benefit radio advertising for reaching light TV viewers and bring new eyes to a network and mini-series. Nielsen expands on the findings with information on how much time Americans are spending with audio, including AM/FM radio, thanks to the prevalence of devices and channels to access this content. Pointing out that audio comprises a wide variety of content, music is the most prevalent “and is experiencing significant growth as consumers embrace everything from satellite radio to digital radio to music streaming services to traditional AM/FM. Notably, the time that Americans spend with music, has grown 37% in just two years,” the study reads. With the increase of audio consumption, Nielsen says many marketers are reevaluating traditional platforms of advertising. Companies like Procter & Gamble are increasing the amount of money they are spending on radio advertising because of Americans thirst for audio content. Nielsen said that combining audio ads with TV spots help reach people that television can’t reach on its own. As noted in earlier studies, even with a heavy schedule of TV ads, portions of the population will not see them. That’s where radio comes in. “Radio usage is higher than TV usage between 6 a.m. and 4 p.m., and television viewing peaks between 5pm and 12am,” according to Nielsen data. “So, when you look at radio and TV combined, a campaign has a much greater likelihood of reaching a wider audience,” Nielsen says. STORY ORIGINALLY PUBLISHED ON INSIDE RADIO. SEE FULL, ORIGINAL STORY HERE. 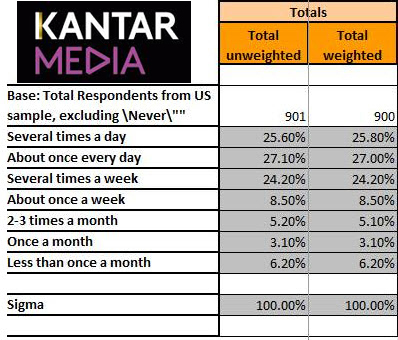 Kantar Media: Broadcast Radio Trumps Online Listening. The latest information provided by Kantar Media found that 25% of Americans listen to AM/FM radio several times a day. That number trumps the listening of online radio, which is at 15%, according the research firm’s Dimension study. Overall, 25.8% of those polled for the study say they listen to broadcast radio several times a day, while 27% listen about once a day and 24.2% listen several times a week. Breaking it down by demos, Kantar Media found that just over 27% of 18-34-year-olds listen to AM/FM radio several times a day, more than 28% listen about once a day, while just under 20% tune in several times a week. Looking at the 35-44-year-old demo, over 31% listen several times a day, almost 25% listen about once a day and 26% tune in several times a week. Nearly 25% of those between 45 and 64 say they listen to AM/FM radio several times a day, nearly 29% listen about once a day and 26% listen several times a week. 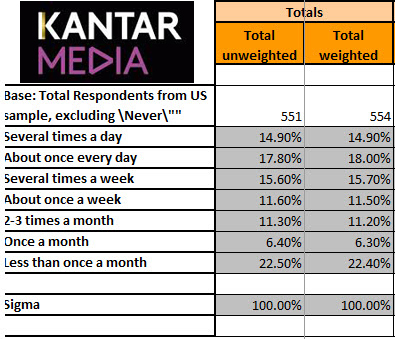 Of those that listen to radio online, Kantar found that, overall, just under 15% of respondents listen several times a day, 18% listen about once a day and nearly 16% listen to radio online several times a week. For those aged 18-34, 22% stream several times a day, just over 20% listen about once a day and nearly 16% listen online several times a week. Kantar found that less than 15% of 35-44-year-olds listen several times a day, more than 25% listen about once every day and 19% listen several times a week. Of those 45-64, less than 9% stream radio online several times a day, just over 13% do so about once a day and more than 14% listen online several times a week. Learn about how phone companies came up with the 10 digit dialing pattern for North America, and then how network based speed dials were subsequently developed. Don’t panic. Don’t jump. Don’t freak out because the phones aren’t ringing, because your website didn’t blow up or that your friends haven’t stopped to tell you how great your commercial sounds.